If you are addicted to reading, listening and watching news then you probably feel your health and your very existence is being threatened by nature. Then in the comfort of your living room you wonder if Albertans have anything to worry about, besides the rising cost of buying gas. Well, West Nile virus (WNV) is something to worry about. The medical officer of health, the Health Promotion Marketing Coordinator of the Palliser Health Region and the media do a good job of keeping the public informed on the subject of West Nile virus. So far I believe our region has had four cases of confirmed WNV and Alberta has had about six. This is a small number compared to what we had in 2002 and 2003 when the first cases of infection in humans in Canada were documented. At that time 1300 confirmed cases of WNV where reported in seven provinces. In 2004, only 26 cases were reported and this year probably it will be less than that. In 2003, Alberta experienced an epidemic of WNV when 275 human cases were reported. Nearly half the human cases (131) occurred in the Palliser Health Region, according to the statistics provided by Gordon Wright, the Health Promotion Marketing Coordinator for Palliser Health Region. Credit should also be given to local municipal authorities who must be doing a good job applying larvicides to control the population of mosquito vectors. And the people are more aware of the dangers of exposing to mosquito bites. Many of them take preventive measures by using mosquito repellent, avoiding peak biting times and wearing protective clothing such as long sleeved shirts, trousers and socks. We should also avoid handling dead birds and animals that may be infected. It is nice to read that we are doing better each year. But this is not the time to lower our guard. The WNV activity typically increases in late summer and early fall. The activity is also influenced by weather conditions and the number of birds and mosquitoes in the region. An article in a recent Canadian Medical Association Journal warns that mosquito repellent should be used with caution in children under the age of 12. They should not be exposed to DEET concentration of more than 10 per cent and DEET should not be used on infants less than six months old. There is no vaccine against WNV infection and there is no definitive treatment. So we have to rely on prevention. When you are outdoors worrying about the mosquitoes you should also remember prevention is the key word when it comes to melanoma. Did you know that malignant melanoma rates have tripled in Alberta over the last 30 years? This is mainly due to our desire to tan. There are three types of skin cancers and melanoma is the worst kind. Prevention with early detection and treatment are the best way to control this problem. Melanoma affects males and females equally. The most common site for males is trunk and for females it is hip and lower limb area. Although skin cancers occur more in sun exposed areas, it is still possible to have skin cancer on any part of the body. Prevention of melanoma is best achieved by use of sun screen, avoiding sun exposure between 10 a.m. and 3 p.m. and wearing wide-brimmed hat. Surgical removal of suspicious looking moles also helps in the prevention of skin cancer. 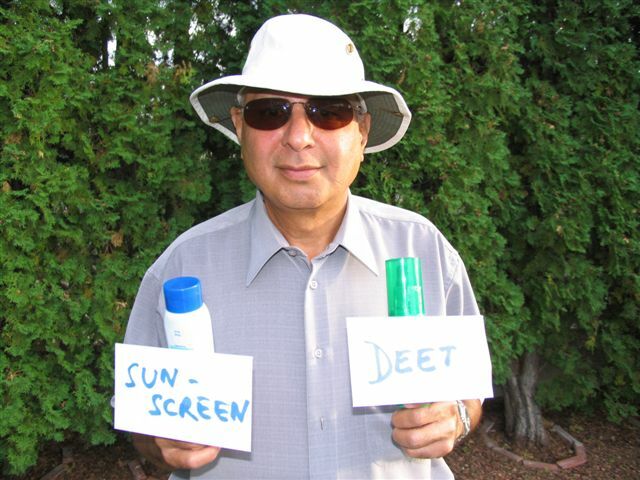 So when you go outdoors, it is better to apply sunscreen first before applying DEET. Looks like we are going to have good weather for sometime to come. So enjoy but take care.